This week was filled with unexpected travel snags, but overall, I was still able to enjoy my time and see and do a lot. I also was able to explore 2 states that I hadn’t had a chance to explore yet. This week started out with making up a trip that got cancelled last week due to weather. I took a tour of the JFK birthplace historic site. JFK only lived in that house until he was 3 years old, but it has still taken a place of historic significance beyond those 3 years. The home was a site where thousands gathered after the assassination. The home also preserves a lot of what life was like in the early 1900s for a middle-class family which was interesting to see since most of the houses that have been preserved from that time are mansions. The tour of the sites focused on aspects of JFK’s childhood and upbringing that helped to prepare him and his siblings for success. All of the rooms have an audio tour by JFK’s mother. While the guide’s no longer use them in every room because of her lack of inclusion of some details and her lack of focus on how things tied to JFK’s later presidency, hearing her voice describe the rooms was really neat and made the restoration feel much more authentic. After going to JFK’s birthplace, I had planned on going in to Boston and going to some of the museums at Harvard. I drove around for 30 minutes near Harvard looking for parking before I gave up and decided to wait for another day to visit those museums. Instead, I head out to the Ecotarium in Worcester. It’s an indoor and outdoor museum and wildlife sanctuary. It was a bit cold, so I did not do much of the wildlife trail, but there were eagles and owls along the path in to the museum that I did get to see. Inside the museum was really neat. Many of the specimens on display are pre-1900, and a few have even gone extinct since their collection. The museum also had beautiful murals on the walls and throughout the exhibits. There was also an exhibit on city science that had different activities about heat in cities and bridge stability and logistics of city planning that was really cool. There was also an entire exhibit on Mount Washington with everything from weather and wind to wildlife that was neat. Overall, I really enjoyed the Ecotarium, and I am glad that I ended up going because I’m not sure that I would have been able to fit it in if I had done the Harvard museums instead. On Saturday, my adventures took me to Delaware. I started the day out at the Delaware Museum of Natural History. I was impressed with their egg collection and their bird collection. They also had a really cool temporary exhibit about viruses and the immune system that had interactive activities on how viruses and antibodies work as well as how DNA works. There was also a large collection of shells, and a coral reef diorama that was built into the floor so you could look down into it which was really cool. The beautiful turtle sculpture is also by the same artist that did the Fearless Girl and Bull statue in New York, and there were several of her sculptures of marine life on display that were all gorgeous. It’s a relatively small museum, but I really enjoyed a lot of their exhibits. After the natural history museum, I went to the Hagley Museum. The Hagley Museum contains the Dupont mansion, the historic black powder mills, a traditional museum with exhibits on industrialism and innovation, and a research library and patent hall. I started out taking a tour of the mansion which has some areas made to look how it would have looked in the early 1800s and some areas designed to look how it would have when its last resident left in the early 1900s. After the mansion, I watched demonstrations on how water turbines were used to power machinery and on how black powder was made. When I finished with the demonstrations, I explored the museum and learned about the continued innovation and safety standards set by the Dupont company today. I really enjoyed my trip to the Hagley Museum, but I was there for way longer than I had planned to be (close to 3 hours with all the tours and demonstrations) which meant a few stops ended up not happening that I had planned on including in my Delaware trip. My next stop was the Old Swedes church. The church itself is small and not overly ornate, but the facts and history are far deeper than just the church. There were carvings in the door dating back to 1711, and the history of the congregation is present throughout the building. The cemetery has numerous American Revolutionary soldiers buried in it, including some fighting Quakers who could no longer be buried in Quaker cemeteries because they fought in the war. There are trees on the ground that were planted by modern day Swedish leaders. So much history has been preserved at Old Swedes church, but I was most impressed by the fact that the church is still tied to an active congregation hundreds of years later. After Old Swedes, I went to the Iron Hill Science Center. This was the biggest waste of time of the day. The science center/ museum part is not even open yet even though public visiting hours are advertised. All that was open was an educational center. The education center was basically a classroom with no exhibits or really anything but tables. They were running merit badge workshops for scouts, but it is a gross overestimation to call it a science center. Because I spent the time driving out to the “science center,” I also ended up running out of time for my last stop of the day. My last stop was at the New Castle Court House. I arrived 54 minutes before the advertised closing time, but the doors were locked. The building itself was pretty, and the square that it is on was charming and quiet. I was more than a little frustrated that they had closed so early, but I was even more upset that if I wouldn’t have done the science center maybe they would have still been open when I got there. 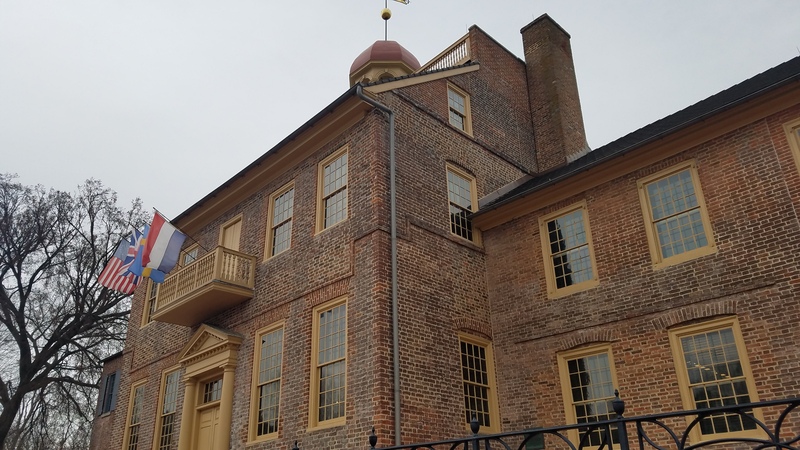 Even with the snags, I still enjoyed a lot of what I saw in Delaware, and I really hope I will get to go back and see the things that I had to cut because of time. On Sunday, I decided to visit New Jersey. I originally had just as many sites planned to squeeze into one day in New Jersey as I did for Delaware. When I wasn’t able to get everything done in Delaware, I decided to change my plans for New Jersey and split my travels into 2 trips. I visited the “Southern” half of my stops on Sunday (still all actually in the Northern half of New Jersey). I started the day in Trenton. 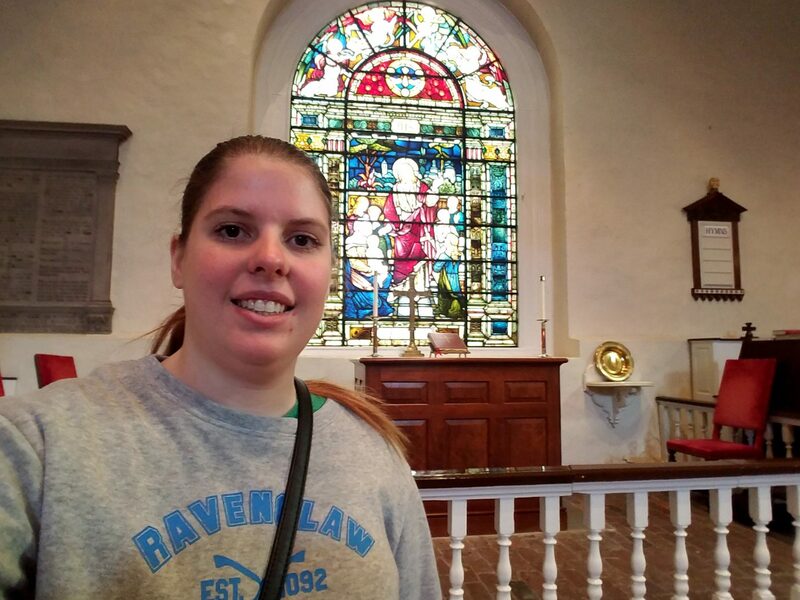 I went to the statue commemorating the Battle of Trenton. It was literally just a statue in the middle of the road. There is also a barracks museum in Trenton that apparently does a little better job of explaining the history and being an actual tourist attraction, but it wasn’t open so I just saw the statue. After stopping at the statue in Trenton, I went to the Princeton Battlefield. There is a little more at the battlefield site than there was in Trenton. The Clarke farm house that served as a hospital after the battle is still standing and is mostly as it was when the battle happened. Inside, the house has been reconstructed to look how the rooms would have looked in the late 1700s. An addition was added on to the house in the 1800s, and that part of the house has been turned into a small museum. My final battlefield stop was the Battle of Monmouth State Park. The park looked like it had a nice museum and visitors center, but they were closed when I arrived. There was a Von Stueben statue and a cannon outside of the museum, but not much else. After visiting 3 battlefield sites in one day, I realized that visiting battlefields is kind of boring especially if there is no museum or interpretive markers. Battlefields are pretty much just fields that had something exciting happen at one time. Unless interpretive markers or museums are on those fields, there would be nothing to set that field apart from a neighboring field. It was still interesting to think about the history of these places, and it was neat to be at the places where such influential battles in the Revolutionary War happened. My last stop of the week was on the suggestion and request of my dad. I went to Asbury Park and stopped outside the Stone Pony. I am not nearly the classic rock fan that my dad is, so I didn’t know about the history of the Stone Pony before he told me about it (sorry everyone). It’s pretty neat to think about how many performers have played there over the years. A line was already forming at the door for the concert that night, and it was neat to think that this place was still helping to shape music today and that maybe one of the performers playing there now could be the next Springsteen or Bon Jovi. The Pony is also conveniently located along the boardwalk, so I walked the boardwalk for a few minutes and took a look at the beach and ocean before heading out. While this week may have had more than its fair share of travel snags, I was still able to see and do a ton this week. Sometimes it’s easy to get caught up in everything that is going wrong without stopping to remember everything that has gone right and all of the fun parts. I’m really grateful for the adventures I did get to go on this week, and I’m hoping to be more positive about the adventures I do get to have instead of regretting the things that didn’t quite work out.